Jersey Shore Boca goalkeeper Chris Konopka is spending time with a second Major League Soccer team this summer as the coaching staff of the MetroStars invited the stalwart keeper to practice with the MLS team during June and July. The Boca GK travels to Giants Stadium four days a week from his Toms River home to practice with the full MetroStars squad. 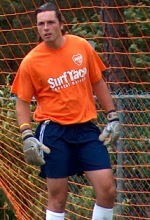 TOMS RIVER, NJ (July 1, 2005) – Jersey Shore Boca goalkeeper Chris Konopka is spending time with a second Major League Soccer team this summer as the coaching staff of the MetroStars invited the stalwart keeper to practice with the MLS team during June and July. Konopka travels to Giants Stadium sometimes three or four days a week from his Toms River home to practice with the full MetroStars squad. During most of June, Konopka worked side-by-side with Metro’s goalkeepers Zach Wells, Jonny Walker and Michael Uetlchey under the direction of head coach Bob Bradley and goalkeeper coach Des McAleean. With the recent departure of Walker to the Columbus Crew and injury to Uetlchey suffered in the Metro’s exhibition game against the Rochester Rhinos last Monday, Konopka was placed in the unique position of being the Metro’s “unofficial” third goalkeeper when he showed-up at East Rutherford on Wednesday behind Wells and US soccer icon and fellow New Jersey native Tony Meola who signed with the MetroStars on Thursday afternoon after he cleared waivers. Meola has represented the United States in three World Cups and played in every MLS season since the league’s inception in 1996, including leading the Wizards to the 2000 MLS Cup championship over the then Bradley-coached Chicago Fire. He has appeared in more games for the US National Team (99) than any other goalkeeper and is second in National history to Kasey Keller for the most wins in history (37) and is second all-time with 32 career shutouts for the US. Konopka and Meola, who worked along side each other Wednesday, Thursday and Friday at practice this week, have another connection in common as both were mentored throughout parts of their development by Jersey native Tim Mulqueen, the former goalkeeper coach for both the MetroStars and Kansas City Wizards who is now currently the United States U-17 National Team goalkeeper coach in Bradenton, Florida. In May, the twenty-year old Konopka was invited to practice with the New England Revolution at their training facility on the grounds of Gillette Stadium in Foxboro, MA after he formally completed his sophomore academic year at Providence College. New England head coach Steve Nicol and goalkeeper coach Dave Wanole placed Konopka right in the mix with the full Revolution side as he faced shots from Rev players Steve Ralston, Clint Dempsey and Pat Noonan who are also members of the full US National Team while training next to New England goalkeepers Matt Reis, another US National Team member, Doug Warren and TJ Tomasso. Current NCAA regulations allow student-athletes with remaining college eligibility to practice with professional teams during the summer months after they fully complete their academic semester and their respective school is out of session, providing certain other specific guidelines are complied with. Konopka, a high-school All-American and 2003 Toms River East graduate, is a long-time member of the Jersey Shore Boca Soccer Club. He also serves as a NJ Olympic Development Program goalkeeper coach and evaluator and a GK Director for Joe Machnick’s No 1 Soccer Camps. The Toms River resident won the starting goalkeeper spot at Providence, a member of the Big-East Conference, mid-way through the 2004 soccer season before injuring his foot against Georgetown University on October 9th. Konopka started seven games for the Friars in 2004. He posted a 2.5 GAA for the year and finished 1st among all Big East goalkeepers with 5.38 saves per game and 10th overall in total saves with 38. During the 2005 spring season he helped Providence to a 3-2-1 record with impressive shut-outs against Harvard University (2-0) and the New Hampshire Phantoms (0-0), a United Soccer Leagues second division professional squad. The Jersey Shore Boca veteran also made fourteen national and international appearances last year for the United States U-19 Regional Team, played in the USL’s Premiere Development League in 2003 with Boca and in 2004 with the New Jersey Falcons and was part of Boca’s Super Y-League and Club teams early in his career. Konopka will begin his third year as a computer graphics and design major at Providence in September. Jersey Shore Boca has been a fixture in the soccer community since 1978 and is one of the most respected soccer clubs on the East Coast. The Club is celebrating their 27th year of existence in 2005.